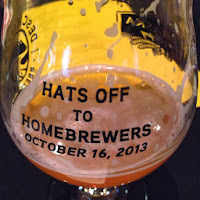 The last week has been insanely full of great Homebrewing events and beer related greatness. Last Wednesday was the "Hats off to Homebrewers" event at Nebraska Brewing Company. Hordes of homebrewers from the Omaha area crowded into NBC for the release of Deschutes Brewing Company beer for the first time in Omaha. I love Deschutes beer and it's one of my favorites from Oregon. When the wife and I went on our honeymoon a couple years ago the Deschutes Mirror Pond was one of my favorite beers to enjoy, and to this day is tied for my favorite pale ale with Nebraska Brewing Company's Cardinal Pale Ale. 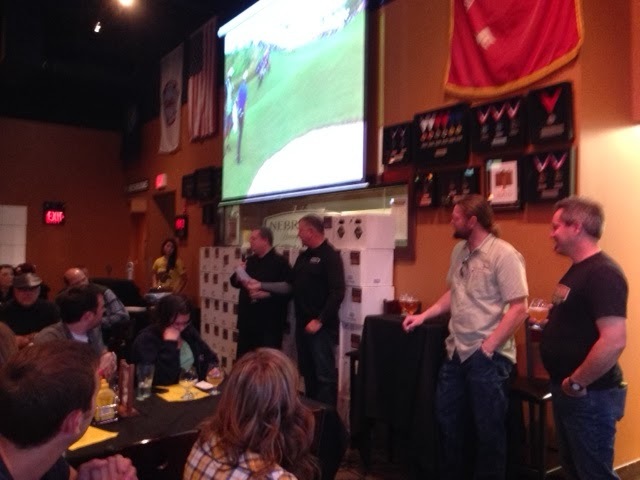 The event kicked off with speeches from Deschutes and NBC brewers. Then Chad talked about his food pairings. He had to do a pairing with two different beers (one Deschutes and one NBC) for each food item. 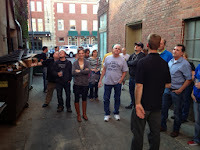 There were three seperate stations to try new beers and consume really excellently prepared food by Chef Chad. From the veal sliders to the prime rib, each entree included NBC beer in the recipe and complimented your beverage well. I was very impressed by the food and loved the beer. After the meal each brewer answered questions from homebrewers and Matt from the new Patriot Homebrew Supply store in Elkhorn gave away a $100 gift certificate. Pretty cool of him to do. I didn't win, but I still decided that I'd stop by as soon as possible because a new homebrew shop in Omaha sounds like a good thing. Especially since it's closer to my house than the other homebrewing shops in town. 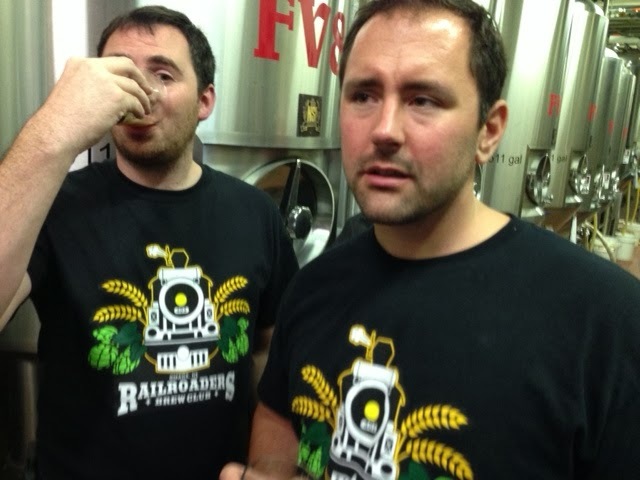 Highlights of the evening were the great showing we had from the Railroaders brew club, we had a great amount of people show up. And the custom glassware they provided for the event. It was really cool to have a nice beer glass provided that was one of a kind. 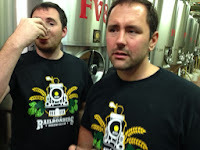 Next on my list of topics for this week is the Railroaders Brew Club bus tour. This tour had it's ups and downs. But mostly ups. In fact there weren't but a few moments that I wish could have gone better. 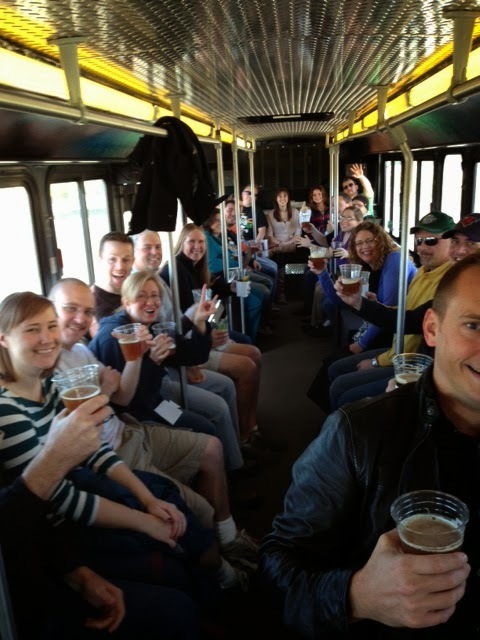 For the most part though the bus tour went incredibly well for a first time taking 37 people to a different city and to four breweries! We loaded the bus at 11:30AM and everyone was early or on time, which is amazing. I have just about never seen a group of people so eager to get on the road and drink some amazing beers! The bus was a really nice party bus we rented in town. 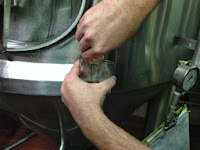 It had two coolers built in where we were able to hook up 3 kegs of beer and keep them cool with ice. The only problem was the seating capacity. We were told it had room for 37 people. The bus ended up being alright but they must have meant 37 midgets....because we got real friendly on the bus that day! 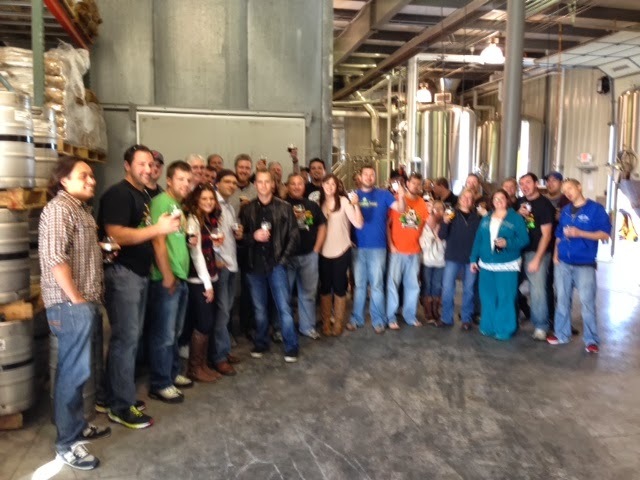 The kegs tapped and beer flowing we started to Lincoln and headed out to Blue Blood Brewing Company for our first stop of the day. Blue Blood is a brewery in Lincoln that was founded by Lincoln Police officers. The beers there are all created in honor of a policeman or friend of the force. So each beer has a great story behind it. Pretty cool, hopefully one day I'll have a beer in my honor. Ha! The tour there went great. We asked plenty of questions and the guys there took their time to answer them. Next we stopped at Zipline Brewing Company. Zipline had some of the best beers I have had all day. I have to say their NZ IPA is a big favorite of mine. They also had a casked porter on tap that blew me away. During the tour we found out that their capacity is surpassing Empyrean for the top spot in Lincoln and that all of their beers are based on Pilsner malt. Pretty neat! 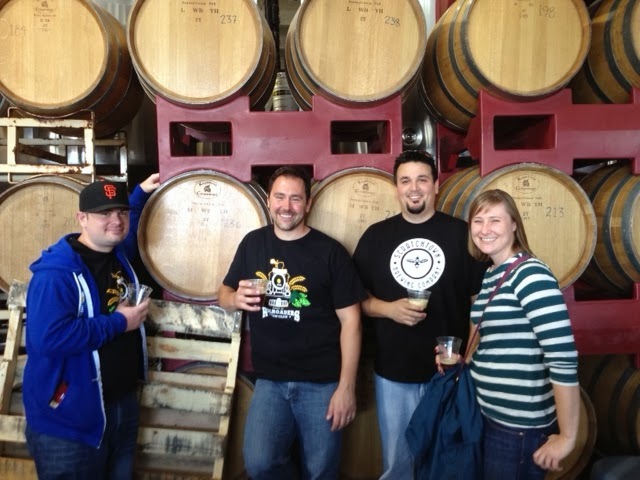 We enjoyed some great beers and chatted with Marcus and Tom. Super cool guys who treated us well. I only wish I had remembered to pick up a t-shirt because I really wanted one. Oh well, next time! One thing I will note, is after we left Zipline. I started to realize that the intake of great craft beer was beginning to effect me in fantastic ways. That's my nice way of saying I was starting to feel it pretty good. Luckily I was able to take a roll call and get everyone back on the bus. I have to say that Chad made the day extremely entertaining because I could tell my good buddy was having about as much fun as you can have. He was very helpful being loud enough to keep the club's attention and direct us when we needed to "roll out" but also you could definitely tell he was nearly three sheets to the wind. Well, by the end of the day, we were all there. That's why we had a bus driver. He took care of us. I have to say, our bus driver Dennis. Was the man. He was really kind and polite. We tipped him and treated him well. Good dude. 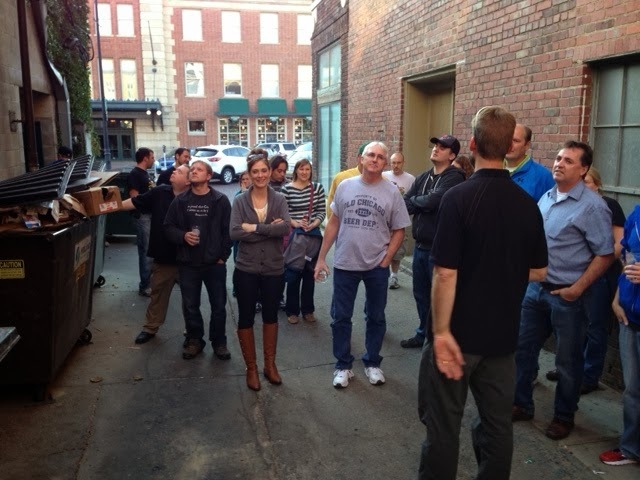 After Zipline was Empyrean Brewing Company. Empyrean makes my favorite ESB. The Luna Sea ESB. 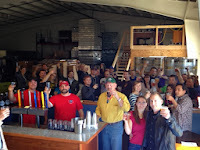 They greeted us with our own Empyrean pint glasses to keep, and poured us pints of IPA and Winter Seasonal. 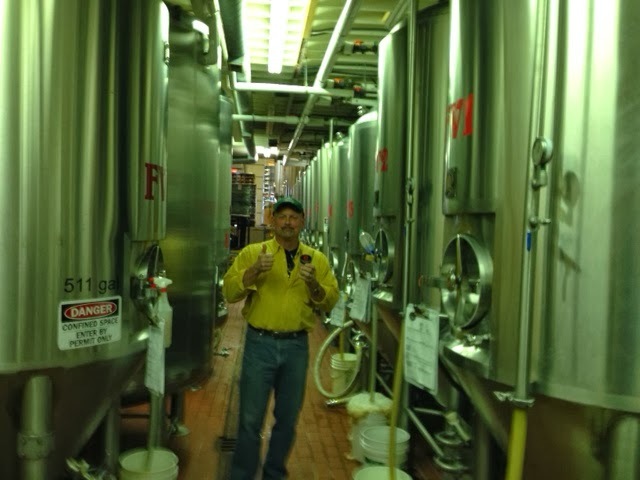 We listened as Jim told us about their brewing system, and toured the brewhouse, fermenter rooms and even got to have some fresh beer straight off the fermenter. Which was really cool! The guys at Empyrean really treated us great. 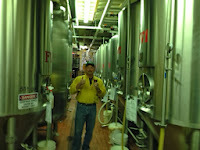 They had plenty of beer throughout the tour and went above and beyond for us. Really excellent of them! After we had our tour we went up to the private event room at Lazlo's. There we had dinner and drank more Empyrean beers. 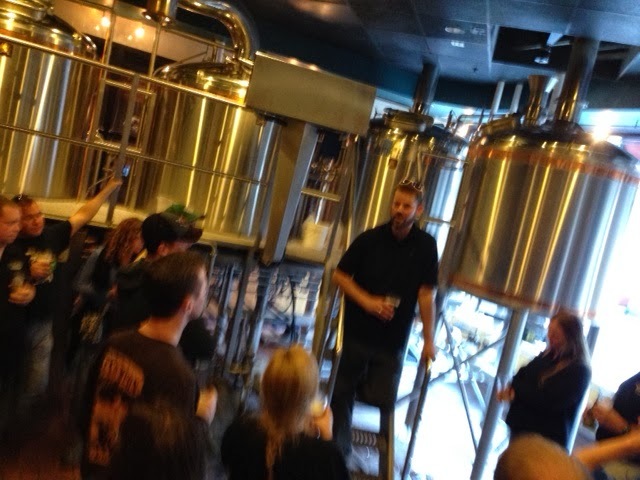 What a great place to have a craft beer event! Excellent food and craft beers with great people! After Empyrean and dinner. The group was pretty well lubricated. 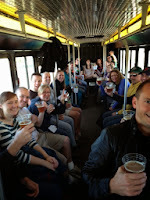 We boarded the bus to Modern Monks/ Misty's and headed to our final brewery destination. I was glad we were able to go enjoy a tour there. But I was not happy that we weren't able to be as attentive as we could have been for our final stop. The beer there was pretty good. But I don't think I was able to fully enjoy it as I should have. Most of the club was in the same boat. If we ever return I will make sure that Modern Monks is one of our first stops instead of our last. That way we can fully invest ourselves in the tour and have a fresh understanding of the beers. Everyone made it home from the trip and home safely. It was a success for a first time taking a club on a "big bus trip" and everyone had positive things to say. 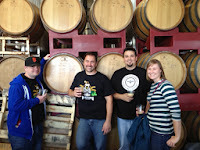 I know that everyone had smiles on their faces and I didn't hear a single person speak of a bad beer all day. I'd call that a win!